Until now, we hadn’t tried any unique pizza recipes. However, we remedied that this weekend by trying chicken ranch pizza! We are Catholic, so every year we give something up for Lent. This year, we are challenging ourselves by giving up meat. Since Lent starts Wednesday, we only have a few more days to eat meat. This pizza was a delicious way to enjoy it while we can! It starts with this perfect crust. 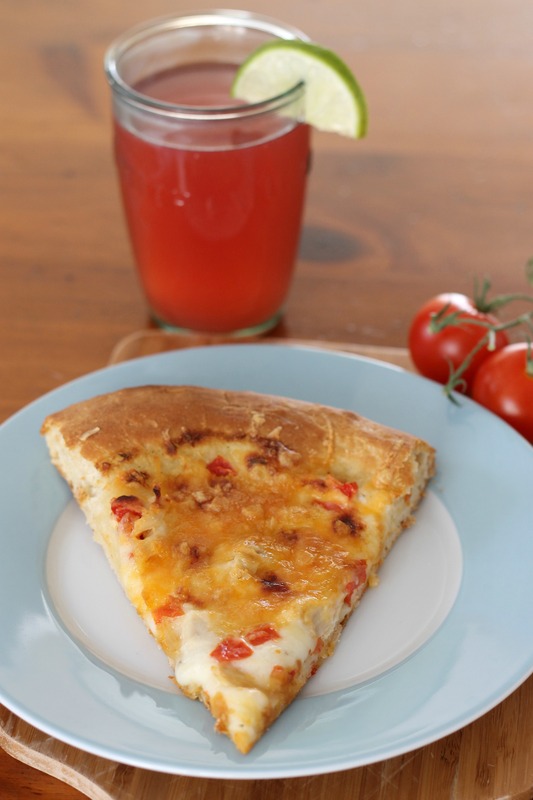 Then, the crust is topped with ranch dressing, mozzarella, cheddar, grilled chicken, tomatoes, and green onions. We forgot to get the onions, so they aren’t on our pizza. We highly recommend adding them though! Another great addition would be bacon. If you like, feel free to make homemade ranch. Regardless, this is a super yummy pizza and was very much enjoyed! Preheat oven to 500 degrees, and let pizza stone heat up for 30 minutes or more. Cut a piece of parchment paper the size of your pizza stone. Sprinkle lightly with cornmeal. Gently roll out the pizza dough into a large circle, leaving a thicker ring around the edge for the crust. Spread the Ranch dressing in a thin layer evenly over the unbaked crust. Sprinkle with shredded mozzarella. Top with grilled chicken, tomato and green onions (and bacon, if using). Sprinkle with shredded cheddar. Once assembled, carefully transfer the parchment round and pizza to the preheated baking stone and return to the oven. Bake for 10-12 minutes, or until the cheese is melted and browned. Slice and enjoy!